In its win over Peru, Team USA Red was led by Janie Reed’s two-run home run that gave the Americans a lead they’d never relinquish. After the win, Reed took to Twitter to share how special of a day this was. Today was one of the best days of my life. My husband finally got to see me play for USA & I hit my first homerun as a Reed. Proud of the name our family represents. Identity in Christ & God first above all else. I love you @JakeyReed5! 😊 Only God can orchestrate days like this. Janie says that the USA team she’s a part of has been developing a bond and a connection over the past few years, specifically in their spiritual lives. Reed says being on the 2020 U.S. Olympic team is a goal but she’s content with whatever plans the Lord has. Reed’s husband, Jake, whom she married in November 2017, is a relief pitcher in the Minnesota Twins organization with Triple-A Rochester, where he’s having a solid year (2.08 ERA in 26 innings) and could see his opportunity to pitch in the big leagues come to fruition at some point. 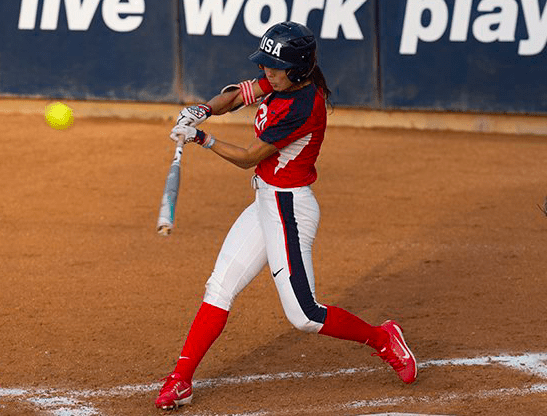 The USA Softball International Cup features teams from China, Japan, Puerto Rico, Mexico and Canada. The tournament continues in California through July 15. On Tuesday, USA Blue will face Venezuela at 7:30 p.m. ET and USA Red will face China at 10 p.m. ET. You can learn more about the tournament and follow along with the results at USASoftballInternationalCup.com.